Artificial bait works ? but fish less than fresh bait. 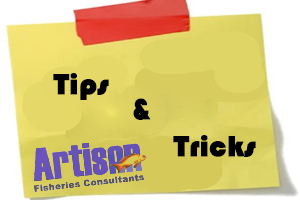 At the same time, you can employ far more hooks with artificial bait than fresh bait; fresh bait takes time to mount and is expensive. 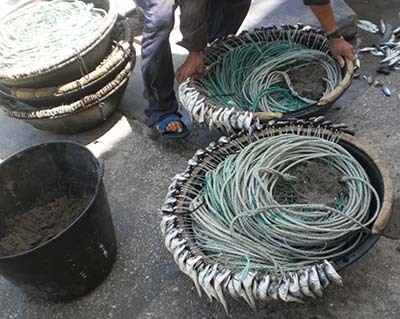 Artificial bait has to be free in the water mass and not on the sea bed. A typical & successful example is the Bass surf line, set in front of the surf in mid-water, where the bait is "dancing" in the current and attracts the Sea Bass when hunting. The fish's attraction for artificial bait is mostly due to other reasons than the bait itself. 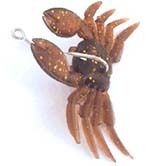 Small creatures such as crab and shrimp is curious about the artificial lures, they creates activity around that bait that the fish cannot resist. When attacking, it ends up eating the artificial bait when the live creatures escape. Octopus skirt has the hook inside the plastic body. First the hook is mounted, then the skirt is threaded onto the hook by cutting a small hole in the head of the skirt, and then the snood is knotted to the swivel on the main line. 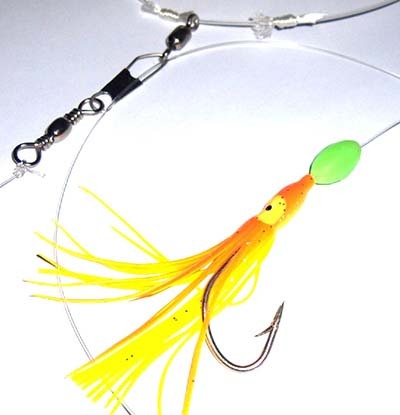 The crab lure has the hook through the body before the mono snood is knotted at the other end to the swivel of the main line. © 2019 Artisan Fisheries Consultants. All rights reserved.